Sigh, in what can be best described as a number of old person’s moments, I have managed to order three books twice from different suppliers. I would not have minded so much had they been one hard copy and one kindle copy each. That I could understand but they were all hard copies. The first two were wargaming rules and Anthony has done very nicely out of them – more games to play in Singapore. The last duplicated was Neil Thomas’ Wargaming Nineteenth Century Europe 1815-1878. Douglas might end up with that next time I am in Canberra, unless he has it already. One book that I had been waiting for, and didn’t double order was John Curry’s Fletcher Pratt’s Naval Wargame, Wargaming with model ships 1900-1945. This contains Fletcher Pratt’s famous naval wargame rules along with other material, some of it previously unpublished Pratt, other material from the likes of Donald Featherstone. Pratt was a military analyst for Time magazine (whose obituary described him as "bearded, gnome-like" and listed "raising marmosets" among his hobbies). He was also a regular reviewer of historical nonfiction and fantasy and science fiction for the New York Times Book Review. Pratt was a contemporary of L. Sprague de Camp and wrote some science fiction with him, as well as on his own. A quick flick though the book tonight and I was starting to remember the games of Pratt’s Naval wargame that we played in the 1970s – a book well worth getting a copy of. 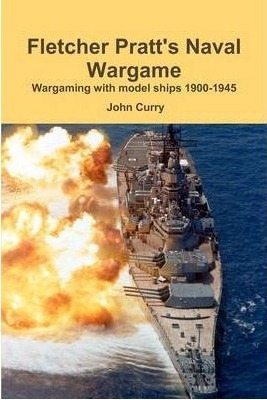 But I do have the Curry Naval Wargaming book, although it has a different cover?